Dec - 14 | By: Oregon Film | one comment. It sounds like a cliché but it’s very true. Innovation is a key ingredient to future economic growth. This is as true in the media industry as it is any other. Over the past few years Oregon has seen several promising media technology companies start up. One such company is Elemental Technologies, which is headquartered in Portland, Oregon. Founded in 2006 by CEO Sam Blackman, Chief Technology Officer Jesse Rosenzweig, and Chief Architect Brian Lewis, Elemental has raised over $16 million in financing, which has directly resulted in Elemental’s rapid ascension to become one of the world’s leaders in software designed for video content creation. In fact, this year Elemental was named as one of America’s Most Promising Companies by Forbes Magazine, placing 54th in a list of 100 companies and out of pool of more than 1000 contestants. 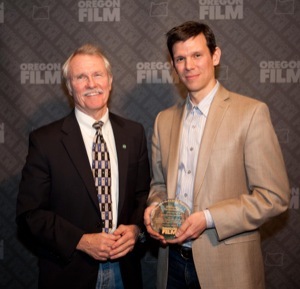 This year at the annual meeting of the Governor’s Office of Film and Television, Governor John Kitzhaber presented Elemental Technologies’ CEO Sam Blackman with this year’s award for Innovation in Media Arts. Elemental has pioneered the use of graphics processors for image processing and video conversion to support adaptive video streaming and traditional broadcast applications. Award-winning products from Elemental help content programmers, service providers and broadcasters bring video to any screen, at any time – all at once. Included in Elemental’s list of clients are ABC, CBS, Comcast, Disney, ESPN, HBO, PBS, National Geographic Cannel, and Big Ten Network. Next year, several international broadcasters will be using Elemental’s products to provide live and on-demand streaming video content to PCs, tablets and smartphones for the 2012 London Olympics. What does this mean for Oregon? First and foremost it means jobs. In 2011, Elemental nearly doubled its workforce from 2010 and all signs point towards an even brighter future. In coming months and years, much of the video content produced here in the state will in some way be distributed to mobile devices thanks in part to Elemental. At the meeting Sam reminded us all that Oregon has a longstanding history of cutting edge video technology companies dating all the way back to the inception of Techtronix in 1946. That tradition continues with new companies like Elemental and as the film and TV landscape continues to evolve, there is no doubt that companies like Elemental will be a great resource for the local and international film and video industry. This is the fourth year that the Innovation Award was presented at the annual meeting. Previous recipients include LAIKA, Ensequence, and Natural Point, Inc..